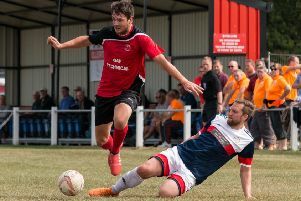 Central Midlands League South Division leaders Sherwood Colliery remain unbeaten after a 2-0 win at Linby Colliery. Both goals came in the first half through Julian Topliss and Max Curzon the scorers. Nathan Benger restored the advantage after 15 minutes and both scorers struck again in the second period. Teversal Reserves tasted success for only the second time with a 2-1 win at Mickleover RBL. Brandon Clarke put Tevie ahead three minutes before half-time. Kurtis Bamford extended the lead just after the hour. before Mickleover replied in the final minute. In the North Division, the bottom two met with Newark Town and Welbeck Lions sharing four goals. Welbeck were two up after 19 minutes with goals from Rob Holland and Dean Isaacs. Newark lost their keeper through injury, but still gained an unlikely point with second-half goals.